This 12 page booklet is a collection of one-dish family favourite ground beef recipes made over with the help of Heart and Stroke dietitians to be heart healthy. 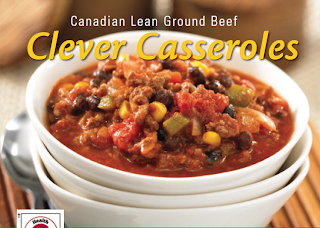 The booklet features lean and extra lean ground beef and has been reviewed and is branded by Health Check™ program. Booklet includes Health Check™ information and tips for heart healthy cooking. This resource provides information about the importance of lean Canadian beef and health. It includes information on beef's 14 essential nutrients, lean beef choices, healthy meal ideas and cooking tips for nutrient-rich eating. This is the how-to booklet for cooking Canadian beef roasts, with information on the goodness of beef including Oven Roasts, Pot Roasts, Rotisserie Roasts and Mini Quick Roasts. Also referenced are Health Check qualified Canadian beef roasts, Cook's Notes tips, recipe ideas, ideas for using leftovers and more. "Double, double" - its' part of the Canadian psyche and a smart way to think about making dinners fast, easy, and good for you too. This issue of Make it Beef's got lots of doubling tips and tricks and so-oo simple recipes too. This booklet is the buying and cooking guide for Canadian Beef, with information on the goodness of beef, standard cooking instructions, cooking tips, Health Check qualified beef and more. In Supper Shortcuts - Family Suppers for Busy Evenings, six pages feature convenient beef meal ideas and recipes to help families serve nutritious meals easy - everyday. Forever flexible is the sane way to think about holiday entertaining. And with Canadian beef, meals are fast, flavourful and good for you too, even in the midst of the hustle and bustle. This issue of Make it Beef helps you keep your options open with 4 recipes that offer different approaches to Hosting the Holidays this season: Slow 'n Easy, Classy Casual, Eat Smart and Easy Elegance. All that, plus tips and tricks to make your entertaining easier.